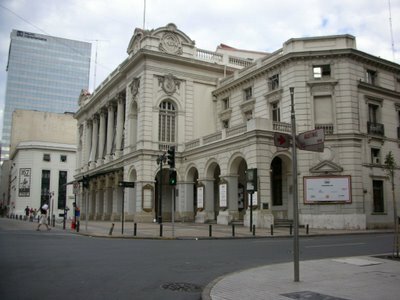 Santiago's Teatro Municipal is the city's main Opera House. It opened its doors in 1857, but had to be rebuilt after a fire destroyed it completely in 1870. Here, you can enjoy classical music concerts, ballet and opera. The interior décor is beautiful and I hope I can show it to you soon. I like the way you captured the old and the new in this shot. Your city has many beautiful buildings. j'espere que l'on verra bien des photos de l'interieur. deja l'architecture exterieure est tres belle. I hope that one will see many photographs of the interior. already external architecture is very beautiful. i was looking for images of santiago and i found this =) it's a great idea. I live here and, despite what my friends think, i always believed than this city is beautiful, we just need to appreciate it more. Thanks Eleanor for your nice comments. It's always encouraging to hear words like yours from a compatriot. I hope to have you around often. Does anyone know who the TENOR was in Carmen at the Municipal, June 27, 1987 or how I could find it out? Google hasn't helped so far.